This week’s book cover is oh-so-cool because dragons. Dragons are cool. And this one’s totally owning this book. City of Dragons by Robin Hobb is the third entry in The Rain Wild Chronicles. New York Times bestselling author Robin Hobb returns to world of the Rain Wilds — called “one of the most gripping settings in modern fantasy” (Booklist) — in City of Dragons. Continuing the enthralling journey she began in her acclaimed Dragon Keeper and Dragon Haven, Hobb rejoins a small group of weak, half-formed and unwanted dragons and their displaced human companions as they search for a legendary sanctuary. Now, as the misfit band approaches its final destination, dragons and keepers alike face a challenge so insurmountable that it threatens to render their long, difficult odyssey utterly meaningless. 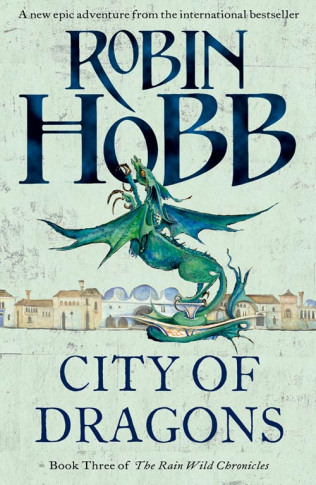 Touching, powerful, and dazzlingly inventive, Hobb’s City of Dragons is not to be missed — further proof that this author belongs alongside Raymond E. Feist, Terry Brooks, and Lois McMaster Bujold in the pantheon of fantasy fiction’s true greats. And she’s a female fantasy author. Hoorah! I have not read this book but I have that dragon as a sticker on my laptop. I love the artwork!